Gerald Tommaso DeLouise (born April 30, 1940), better known by his stage name Burt Young, is an American actor, painter and author. He is best known for his Academy Award-nominated role as Sylvester Stallone's character's brother-in-law and best friend Paulie Pennino in the Rocky film series. He also had praised roles in The Gambler, Chinatown, Uncle Joe Shannon, Back to School, Once Upon A Time in America, and Convoy. Young was born in Queens, New York, the son of Josephine and Michael, a high school shop teacher. He is of Italian descent. He was trained by Lee Strasberg at the Actors Studio. Young is a widower and has one daughter, Anne Morea. He lives in Port Washington, New York. Young served a tour of duty in the United States Marine Corps from 1957 to 1959. Young made his name playing rough-edged working class Italian-American characters, the best-known example being his signature role as Sylvester Stallone's character's brother-in-law Paulie in Rocky (1976), for which he received an Oscar nomination for Best Supporting Actor. He is one of four actors (the other three being Stallone, Stu Nahan and Tony Burton) who have appeared in all of the first six Rocky films (although Talia Shire also appears in the first five films and makes a flashback appearance in the sixth). Young did not reprise his role in the 2015 film Creed, with the character having died in 2012. He has played similar roles in Chinatown, Convoy, Back to School, The Pope of Greenwich Village, Once Upon a Time in America, Last Exit to Brooklyn, Downtown: A Street Tale, and even a brutal and darker role in Amityville II: The Possession. Young has also appeared in many television programs, including The Rockford Files, Baretta, Law & Order, Walker, Texas Ranger, M*A*S*H, guest-starred in a Miami Vice episode, and made an appearance on The Sopranos ("Another Toothpick") as Bobby Baccalieri's father, who is dying of cancer and comes out of retirement to execute a hit on his godson. During this era, Young was considered one of Hollywood's top male actors. After appearing in the films Convoy, and Once Upon a Time in America, as well as a lead comedic role in Back to School. Young is a painter whose art has been displayed in galleries throughout the world. As an artist, he has collaborated with the writer Gabriele Tinti, for whom he designed the cover for the poetry collection All over, as well as contributing the illustrations for the art book A man. Young is also a published author whose works include two filmed screenplays and a 400-page historically based novel called Endings. 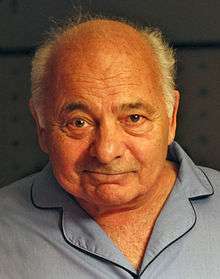 In 2017, Burt Young will return to the stage as an aged mob boss in "The Last Vig," a new play written by Dave Varriale. The show is scheduled to run from January 14 - February 19, 2017, at The Zephyr Theatre in Los Angeles. 1973 M*A*S*H (1973) Lieutenant Willis Episode: "L.I.P. (Local Indigenous Personnel)"
↑ Burt Young Biography – Yahoo! Movies Archived January 7, 2007, at the Wayback Machine. ↑ Bock, Hal (October 26, 1984). "Marathon Week can be hazardous to health". Times-News. Hendersonville, North Carolina. AP. p. 17. Retrieved January 11, 2011.